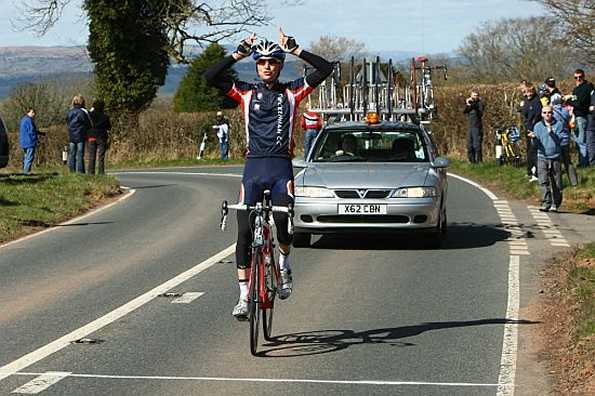 Stuart King Rides his First Road Race - and WINS! I tried in vain, last week, to introduce the concept of the 1497 report. This week’s race, however, changed this assumption. As a rarity I arrived in good time for the race this week. Unfortunately it was a chilly evening and I cooled down too much before the start. My spirits were lifted when Sandy King and his brother Stuart arrived. It was good to see some other TCC shirts. Sandy, of course, was to ride in the E/1/2/3 race and Stuart King joined me in the 4ths. So to the start. Feeling the cold for the first few laps and being bombarded with grit from the damp surface, I was not in my most confident mood. Nevertheless I stuck to my usual strategy by staying near the front and keeping out of trouble. I soon started to feel better and never really felt stretched throughout the race. The theme of the race was ATTACK, as every lap someone tried to slip away to form a break. The first attempt nearly worked as six riders got away temporarily and had they worked together the result might have been different. And so it went on, attack, capture, attack, capture. In the latter stages of the race Stuart also attacked with another rider but this too was soon brought back to the main group. The 3 laps to go board. I was determined not to repeat my mistake of last week and worked hard to get near the front and hold my place there. I achieved this by taking places on the outside of the right hand hairpin bend. Not a particularly popular move with my fellow competitors but effective overall. I regretted not paying more attention to Mr Peck’s advice about arriving at the front too quickly as my next move through the group found me sitting in 2nd place heading down the back straight on the final lap. I had no choice but to stick with it. Unfortunately the rider in front had been on the front for at least five laps so I knew he was not a strong wheel to follow. Rounding the bottom bend I accelerated to hold my position and waited for the sprint for the line. I was then swarmed as the stronger riders made their moves. Much weaving, elbows and all out effort then followed and a final dive over the line. I had given too much on the last lap and as I looked around I can only guess that I finished around 11th or 12th. The E/1/2/3. I only saw the final two laps of the E/1/2/3 race. With one lap to go Sandy King had formed a small break of 20 metres with another rider. Unfortunately the break did not survive and Sandy finished safely in the main group.